Today I will discuss about three basics and very core concepts of BPC, and then will share some definition and step by step process to create all these three objects, this document is for those who are beginner in BPC. Environment can be defined as the base components which doesn’t contain physical data. It can be considered as INFOAREA from BW perspective, which acts as a folder. Environment can’t be created by our own, we have to take copy from existing environment only. 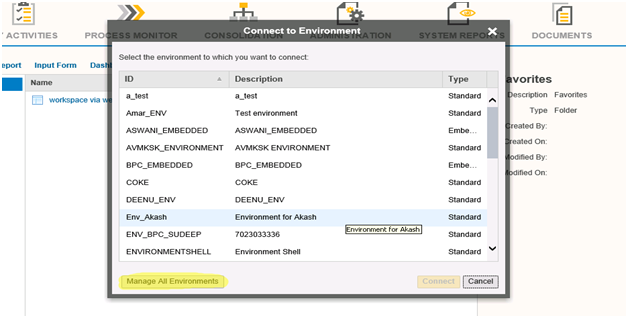 SAP provides one standard environment which is called as “ENVIRONMENTSHELL”. NOTE: – It is highly recommended not to do modification and changes directly to “ENVIRONMENTSHELL”. Steps to create Environment in BPC. Logon to BPC with username and password. 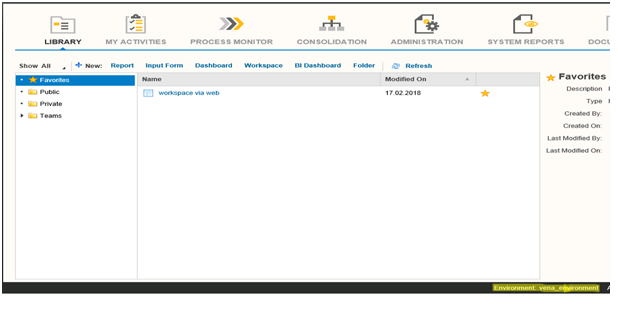 3) Single click on Environment will bring one popup screen for you, then go to manage all environment, here we can get list of Environment which is delivered by SAP along with the list of Environment which is being copied by user. 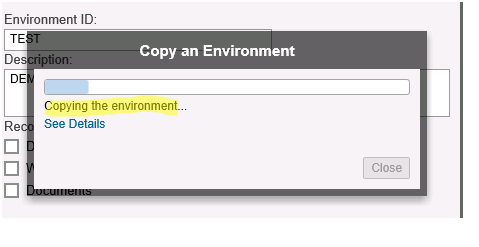 4)To create copy from standard Environment, simply click on the SAP delivered Environment, when you will click on the Environment, “COPY” icon will get enable, click on “COPY”, a popup will appear which ask you for ENIRONMENT ID: and description. Provide check marks to copy a)Data in Models b) Web Documents c) Document to the newly created Environment as per your requirements. NOTE: Copying Environment will take some time to copy. Models :- A model is built inside an Environment , It is collection of several dimensions and are designed to meet the planning and consolidation requirements of an organization, For instance in a company, we might have model for “ANALYTICS” , “TECHNICAL”, “HR” etc. It can be compared with InfoCube in BW terminology. Model will be used to store transaction data. 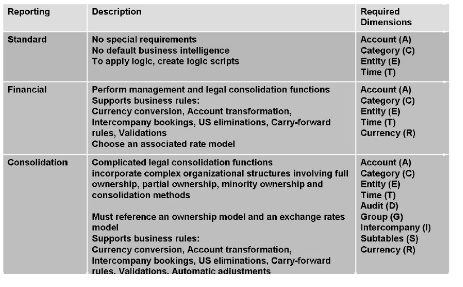 STANDARD MODEL : This model is designed by SAP to provide a protected area for customers who to plan and consolidate in their own department without wanting to share or coordinate the resources with other Business Warehouse community users. EMBEDDED MODEL : This model is different from Standard model and includes data access to all community users. In short, you can say that in embedded model, any number of InfoProviders can be assigned to a single BPC model/application. 2) Go to Administration page. 3) Click on Models and you will get list of all standard and Embedded models which is being already created, to create a new model click on new. 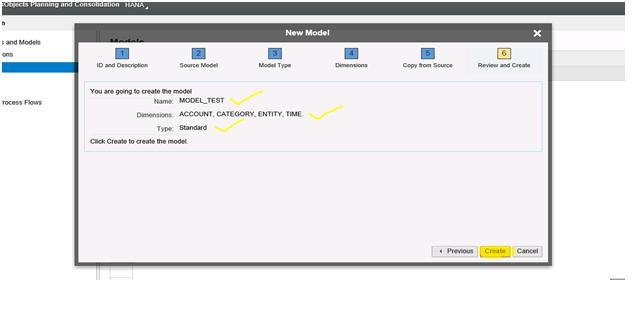 4) Provide name and description of the model click on next. 5) Under source model, click on blank model , since we are creating this for first time and do not want to copy from the existing models then click on next. 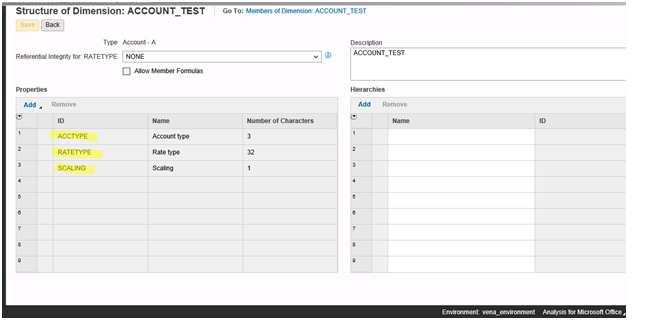 6)Now choose standard radio button from the list, in data entry mode we have default entry as Periodic for standard models. Click on next. 8) Now in copy from you will find blank, since we started from blank model, click on next. 10) You can see your model created in the model list. DIMENSIONS: It is used to store master data. In BW language it can be compared with Infoobject. 3) Click on dimensions and you will get list of all dimensions which is being already created, to create a new dimension click on new. 5) Once created, it will show structure of dimension which is automatically created by system with some specific properties and can’t be changed. The system generated properties will be highlighted in light blue list of rows. 7) You can give referential integrity if you want to give reference with the existing dimension, in my case I have chosen none. 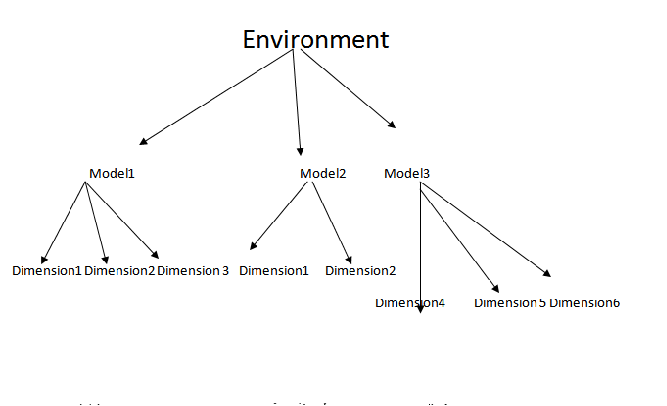 To understand relation between Environment, models and dimensions in simple language, see below diagram. 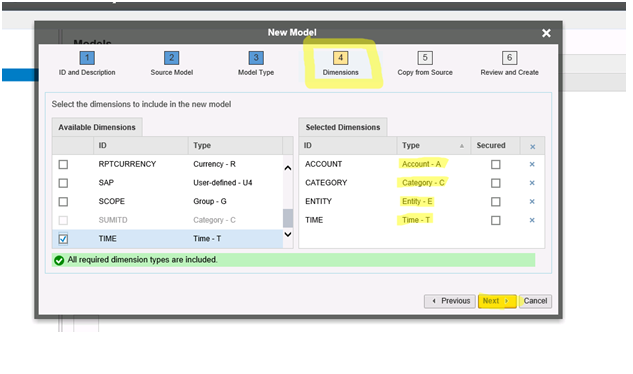 NOTE- one dimension can be reused in multiple models but all these models belongs to same environment only.